Psyche Out! is one of Wario's minigames in Super Mario 64 DS. 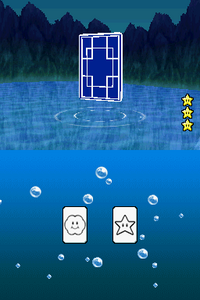 The player is shown the back of a card, and is asked to use their "psychic" powers to guess which of two symbols is on the front of the card. It could be a Mushroom, Fire Flower, Starman, cloud, or a Cape Feather. In reality, the card is not entirely opaque and eagle-eyed players can make out the symbol on the front. The player can keep playing until they guess incorrectly. After guessing correctly five times, the card becomes harder to see through and the player has to choose from three symbols. Are you psychic? Can you guess what's on the card's other side? Maybe if you stare at it long enough, a vision will come to you. German Die Macht des Geistes! The Power of Mind! If the player can guess five correct answers, the word LUCKY! will appear. After getting fifteen points, the word PSYCHIC! will come up. The music for Psyche Out! is the Jolly Roger Bay/Dire, Dire Docks music, but it is slower and plays only one variation. This page was last edited on April 3, 2019, at 08:56.